SiteGround recently became a recommended host featured on WordPress.org’s hosting page, a page that only features three other hosts. It offers several plans optimized for WordPress as well as many resources for beginner WordPress users, such as knowledge base articles designed to guide you through the basics and a support team filled with WordPress experts. Let’s take a closer look at this host. 16 Who is This Host for? SiteGround was founded by a handful of university students in 2004. They’ve now grown into a host with over 400 employees that powers over 500,000 domains. This host offers several different levels of hosting, including shared hosting, WordPress hosting, cloud hosting, dedicated hosting and reseller hosting. It also supports other popular applications, including Joomla, Drupal, Magento and PrestaShop. It even offers hosting optimized for Joomla. Let’s talk more about the plans this host offers. SiteGround offers several different types of hosting as well as several tiers per type of hosting, but we’re going to focus on the main types of hosting most folks considering SiteGround will likely choose. SiteGround’s shared hosting differs from the shared hosting offered by other hosts. Sites in a SiteGround shared hosting environment run in a cloud-based infrastructure commonly known as a virtual private server, or VPS hosting. This means your site still shares the same physical resources (hardware) as other sites, but it has its own space due to the magic of cloud-based servers. 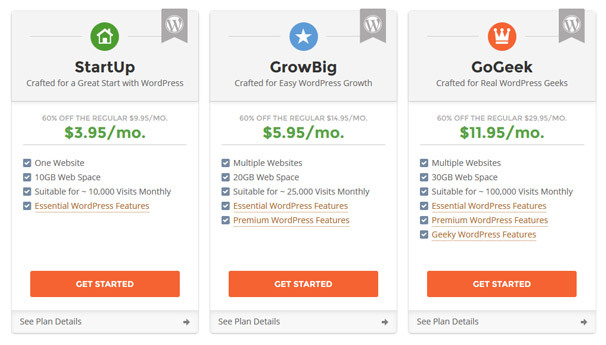 SiteGround offers three tiers for shared hosting, and prices range from $9.95/month to $29.95/month, but you can use our link to receive a 60% discount that drops these rates down to $3.95/month to $11.95/month. No code required. The cheapest option allows you to host a single website that can handle as many as 10,000 monthly visits and allows up to 10GB of SSD storage. The most expensive tier allows you to host an unlimited number of websites that can handle as many as 100,000 visits per month and allows up to 30GB of SSD storage. Therefore, prices range from $80/month to $420/month. SiteGround offers three dedicated hosting tiers that range from £147/month to £275/month. These servers are powered by between 4-core and dual 6-core CPUs, between 4 and 16GB of RAM, and between 500GB and four 500GB HDDs. The two cheapest tiers use SATA II drives while the most expensive tier uses SATA III drives. SiteGround also offers custom-built servers for enterprises. This level of hosting doesn’t come with ready-made plans. SiteGround asks for information about your business as well as how much money you’re able to allocate for hosting every month before configuring a server for you. It does, however, offer two data centers, one in Chicago and one in Amsterdam, and replicates your data between each. SiteGround offers 24/7 support through such forms as phone support, live chat support and ticket support. All support shifts are overstaffed, which is why SiteGround’s response times for support are instantly for phone, instantly for chat and within 10 minutes for tickets. Its support system also has an in-house, issue-tracking and load-balancing system that allows it to optimize the way it handles support requests. It also offers CMS-specific support, such as WordPress-related support. Another level of support it offers is a large knowledge base filled with helpful articles. SiteGround is quickly becoming one of the most recommended hosts in the industry, and for good reason, too. Let’s talk about a few of those reasons. SiteGround offers several different types of hosting and several different plans per type of hosting. It has enough variations to suit beginner bloggers and enterprises alike. This gives you or your client the ability to start with a cheap server and upgrade to one capable of handling your growing site when you need it without having to go through the hassle of researching for and changing hosts. 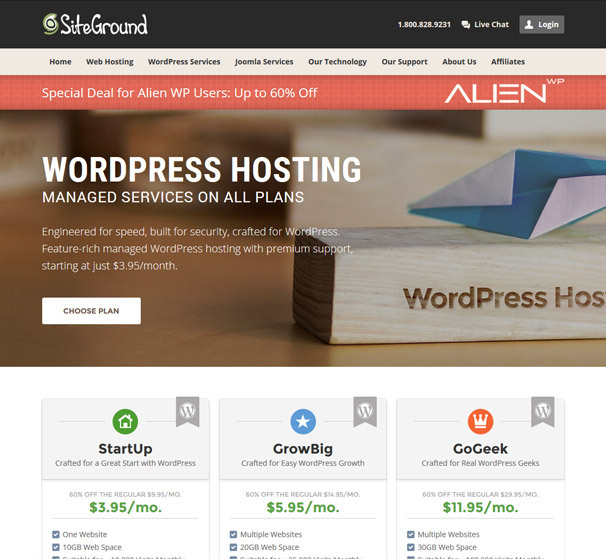 SiteGround is one of few hosts that ensures its servers and services are optimized for WordPress. They offer separate versions of their shared hosting plans and cater them exclusively to WordPress, even offering services typically only found in more expensive plans offered by dedicated managed WordPress hosts. WordPress developers can even joy using WP-CLI, staging and having Git pre-installed. SiteGround protects your site in a variety of different ways. This starts with having every new server use PHP 7 complete with the latest security fixes by default and continues by running Apache in a chroot environment via suEXEC. SiteGround also uses sophisticated IDS and IPS systems to protect your site from malicious attacks. Shared servers are also protected by a firewall via ModSecurity. You can also step up DDoS protection by enabling the free tier of Cloudflare for your account via cPanel. Let’s go over the disadvantages of hosting with SiteGround. The biggest problem with this con is the fact that it isn’t disclosed anywhere on the site. It’s not even disclosed on the shared hosting sales page despite the fact that it’s a problem many customers run into as they receive notifications from SiteGround once they surpass their CPU allowance. SiteGround states you’ll receive this notice when your server is producing an unusually high number of executions, which SiteGround explains typically occurs when something irregular happens on your website or when your site receives a peak in traffic. They’ve written a tutorial that explains how to reduce the number of executions happening on your site, but many customers state the only viable solution is to upgrade to the GoGeek plan, which reportedly doesn’t have a strict CPU allowance. SiteGround’s limits for storage on shared hosting plans are 10GB, 20GB and 30GB. It’s true that no host can truly offer “unlimited” everything, but the limitations for storage on these plans could be strict depending on your requirements, for example if you host a lot of large files or backups. Who is This Host for? This host is suitable for a variety of different individuals and businesses. Beginner bloggers and WordPress users will do fine on one of the shared hosting/WordPress hosting plans while large businesses will find the cloud and dedicated hosting plans to be better suited for them. There are even plans for enterprise-sized businesses, as mentioned earlier, and if you’re a developer, you’ll love the reseller hosting SiteGround offers as it’s designed for developers who maintain their clients’ sites on a regular basis. If you fall into the first category we mention and are ready to give SiteGround a try, use the link below to gain access to a discount of up to 60% on WordPress hosting. I have worked with Siteground for a number of years now with multiple websites. Their hosting offering for WordPress is rock-solid, I didnt experience any technical issues while I was with them. If you are looking for a host with great support then Siteground are one to look at – any time I contacted support, I had a technicial get back to me within the hour and any question or problem I had was solved very quickly.